Good Morning ! 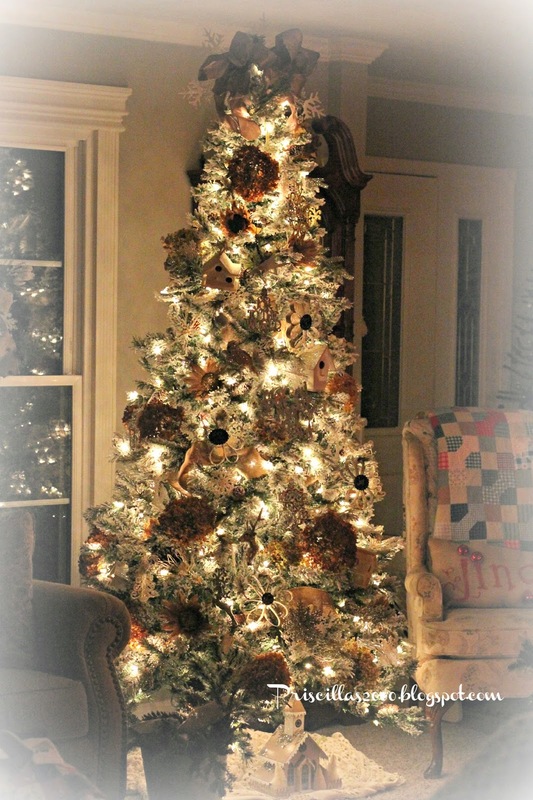 I am sharing the new flocked tree that we got this year ..One of my smaller 4 foot trees got damaged..and I told my husband I wanted a small white tree to replace it and that I would get it after Christmas ..A day or two later this huge flocked tree came home with him :) Can you believe it came from Walmart ?!? I already had my ice skate tree here in this spot all decorated ..but this tree wouldn't fit in the dining room where the smaller tree was last year . So we dragged the ice skate tree fully decorated into the dining room .. 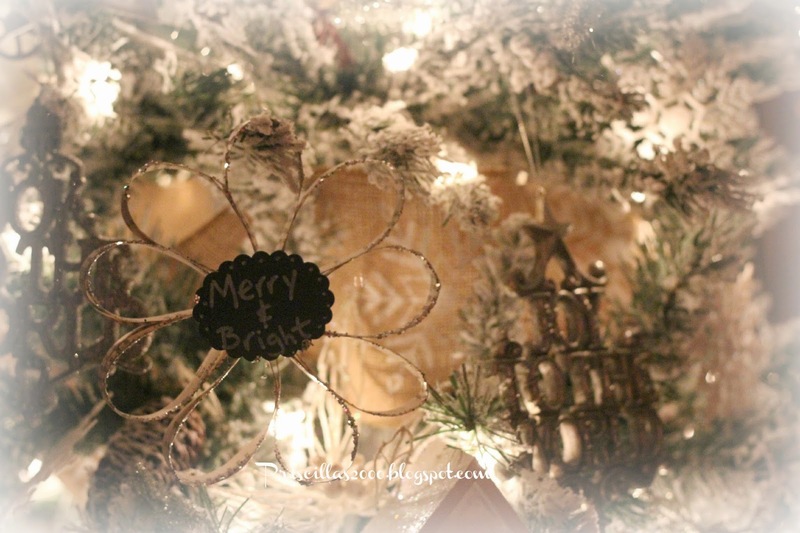 I decorated the flocked tree very simply with dried hydrangeas from our yard..the book page ornaments I made last year ..burlap sunflowers..burlap ribbon ..birdhouses painted white .. and silver and white ornaments .. When I get some time I will probably make more of the book page ornaments since they look so pretty on the tree.. Under the tree I used a vintage crocheted table cloth for the tree skirt ..on top of that is a galvanized bucket of evergreen branches with pinecones ,ornaments and a burlap bow.. One of the glitter houses from Homegoods sits next to the bucket.. 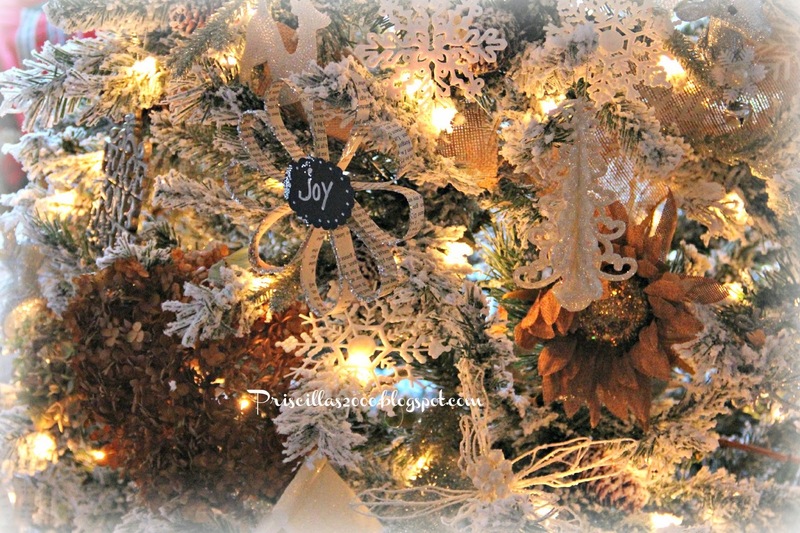 It matches the flocked wreaths I had made that same day the tree came home ..when I didn't even know I was getting a flocked tree ! That tree has a very natural look to it, so pretty. 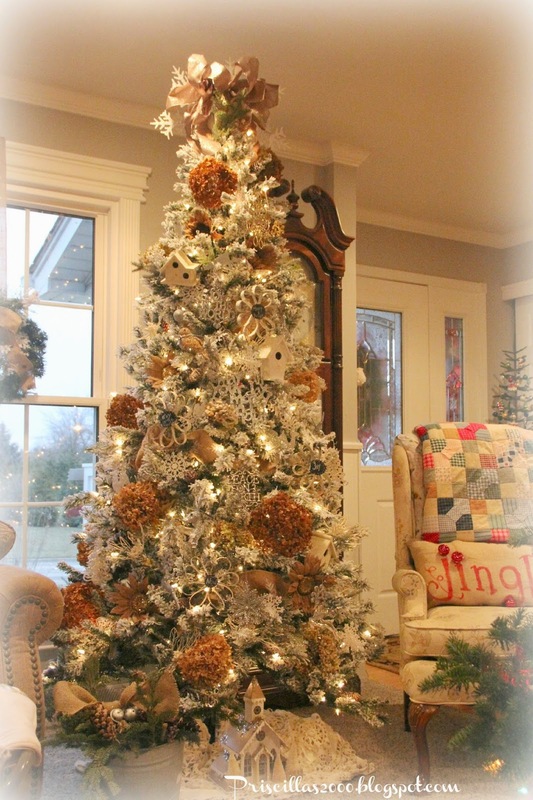 I love the idea of a vintage table cloth for the tree skirt. The tree is really beautiful! 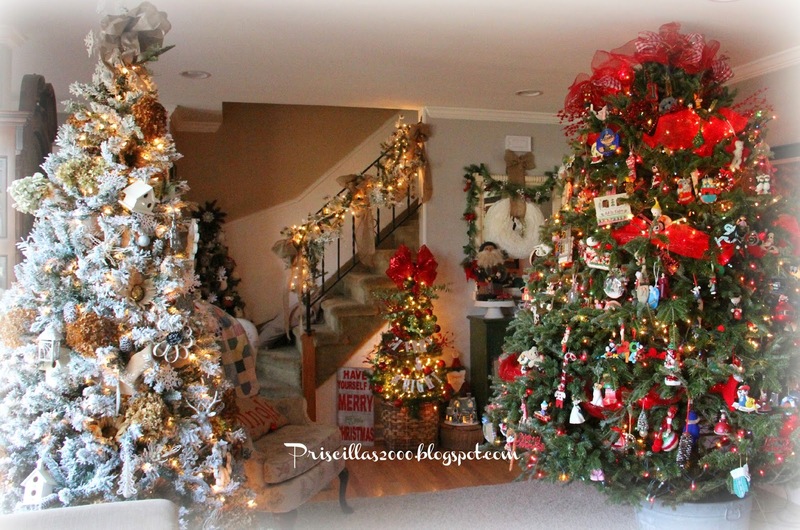 You really do amaze with with all of your pretty Christmasing! It's always so nice to hear from you. Oh what a beautiful tree!!! 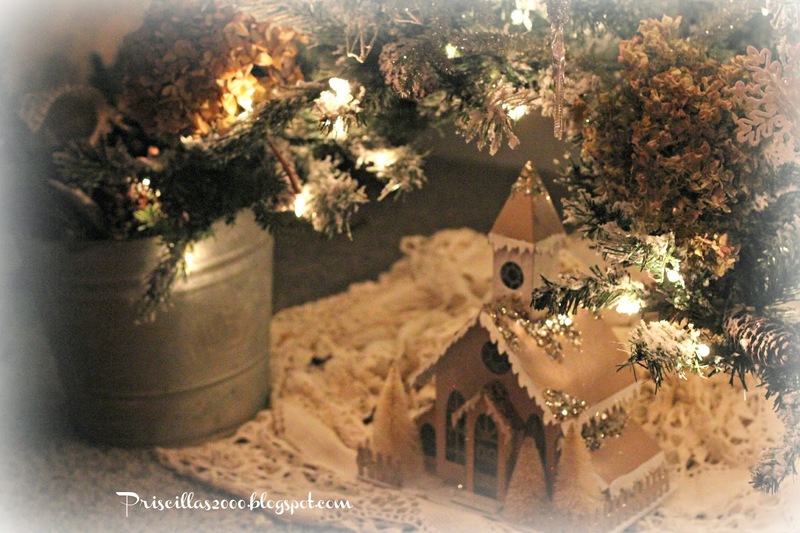 Thank you for posting such beautiful pictures of inspiration on your blog! I read it all the time and get inspiration from it!!! All of your trees are gorgeous! Do you have a favorite? Oh, what a beautiful C'mas tree and everything around it. I love the snowy tree too. So pretty! I will have to locate how to make the book page ornaments--love them LOTS! Thanks for sharing! 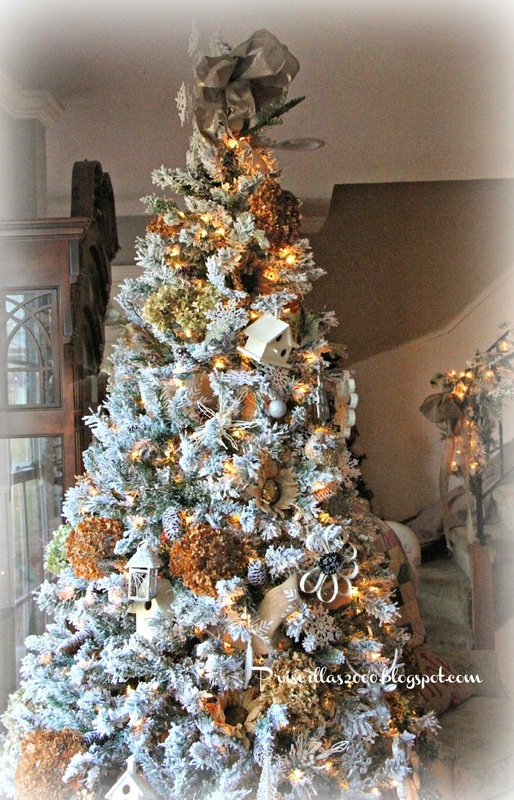 Oh Christmas Tree, Oh Christmas Tree I have to have a flocked tree!!! Beautiful!!!!!! 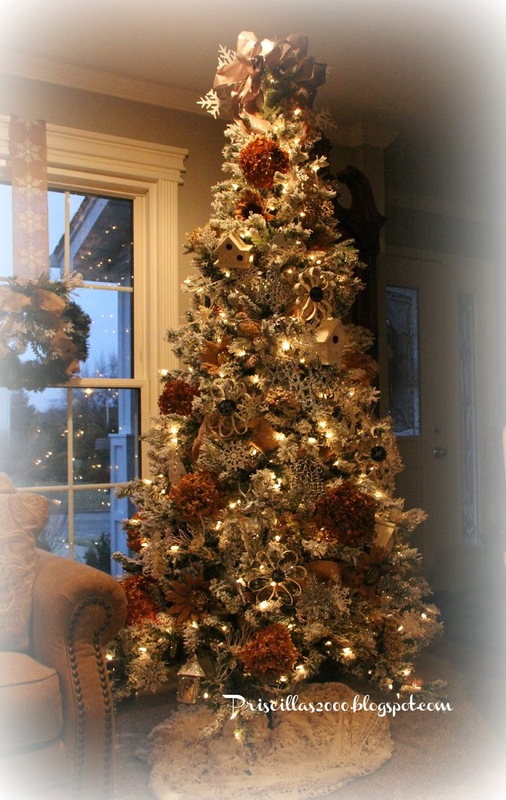 LOVE this flocked Tree and how you have decorated it!! 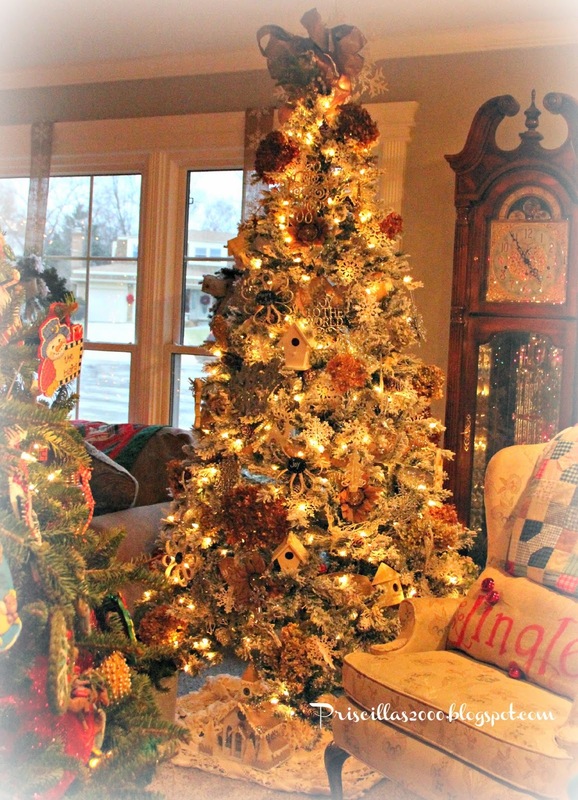 I think me , you and penny over at Penny's Vintage Home are the only ones with so many Trees in Blogland!! LOL! I would love to get a flocked tree for the LR but I will wait until the one I have there now loses it's appeal and looks!! LOL!! Another amazing tree!! Oh, my! !